Smell and taste are two strong senses that work in harmony. The ability to taste something is highly influenced by one’s ability to smell an aroma. Our smelling power also plays an important role in warning us against harmful or even life-threatening fires, toxic chemicals, poisonous substances or certain gasses. There are many causes behind loss of smell and taste. One of the main causes is aging, which brings on degeneration of nerve cells that control smell and taste buds. Other causes include excessive smoking, nutritional deficiencies, certain nervous system diseases, radiation therapy, fever, blocked nasal passages, sinusitis, viral or upper respiratory infections, and gum diseases. Loss of smell and taste can have a significant impact on quality of life, often leading to loss of appetite and poor nutrition as eating food becomes less enjoyable. This can contribute to depression and many other health problems. 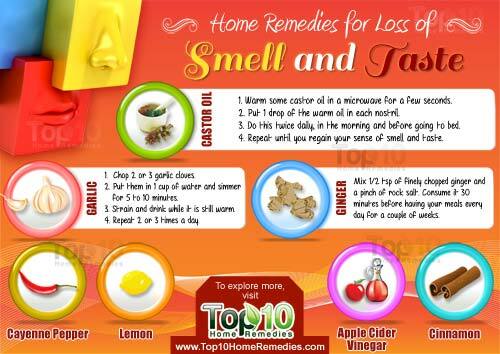 If you are experiencing loss of taste and smell, try some simple home remedies to help restore these important senses. 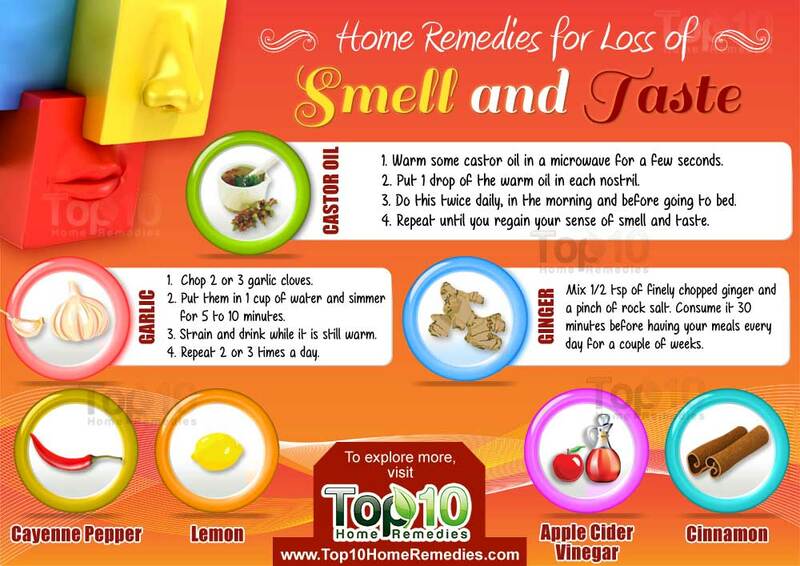 Here are the top 10 home remedies for loss of smell and taste. Castor oil is one of the best home remedies for loss of smell and taste. It has antimicrobial, antioxidant and anti-inflammatory properties, which help keep the nasal passages clear. Warm some castor oil in a microwave for a few seconds. Put 1 drop of the warm oil in each nostril. Do this twice daily, in the morning and before going to bed. Repeat until you regain your sense of smell and taste. Garlic also helps restore the senses of smell and taste. It helps clear nasal congestion and open up blocked nasal passages, in turn improving your smelling power. Chop 2 or 3 garlic cloves. Put them in 1 cup of water and simmer for 5 to 10 minutes. Strain and drink while it is still warm. Repeat 2 or 3 times a day. 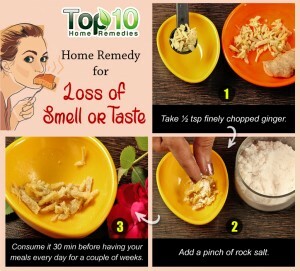 Ginger is another effective remedy for loss of smell and taste. The pungent flavor of ginger can enhance the sensory quality of the food and make eating a more pleasurable experience. It also activates the taste buds and stimulates taste. Chew small pieces of raw ginger at regular intervals. Mix ½ teaspoon of finely chopped ginger and a pinch of rock salt. Consume it 30 minutes before having your meals every day for a couple of weeks. You can also drink 2 to 3 cups of ginger tea daily. 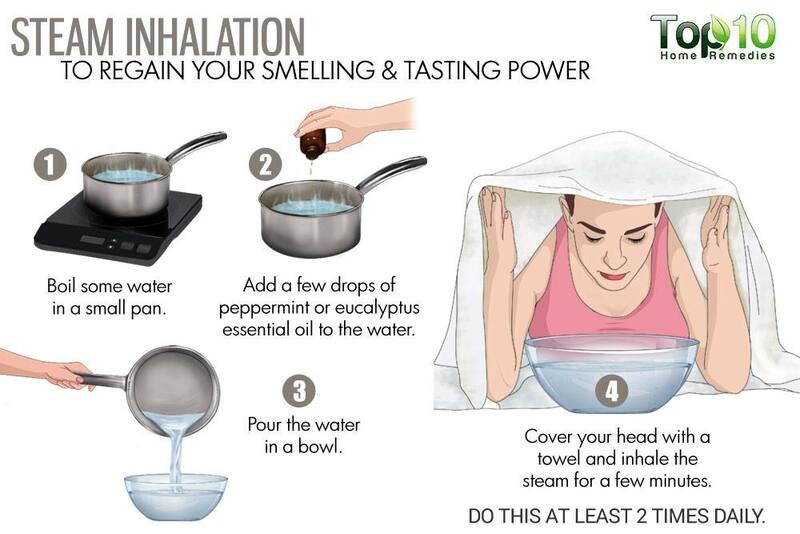 Steam inhalation can help regain your smelling and tasting power, if the cause is nasal congestion. The moist, warm steam will reduce inflammation and clear up the blockage in the nasal passages. Boil some water in a small pan. Add a few drops of peppermint or eucalyptus essential oil to the water. Cover your head with a towel and inhale the steam for a few minutes. Do this at least 2 times daily. If sinusitis, the common cold or upper respiratory infections are causing loss of smell and taste, try cayenne pepper. Its active component capsaicin helps reduce nasal congestion. It also stimulates saliva production, which improves taste. Mix 1 teaspoon each of cayenne pepper and honey and have it a few times a day to loosen up mucus and stimulate secretion. Include cayenne pepper in your cooking to help stimulate your salivary glands. You can also use black pepper as it stimulates the taste buds. The citrus smell and flavor of lemon juice can help restore your smelling and tasting power. Moreover, it is rich in vitamin C, an antioxidant that enhances the body’s immunity to help fight diseases and infections. Squeeze the juice of 1 lemon into a glass of warm water. Mix in 2 teaspoons of raw honey. Drink the warm mixture twice daily. Eat a small piece of fresh or pickled lemon between meals to stimulate the taste buds. Put a few drops of lemon essential oil on a handkerchief and sniff it in the morning and evening for a few seconds at a time. Do this for several weeks. Also, use lemon juice to enhance the flavor of foods. 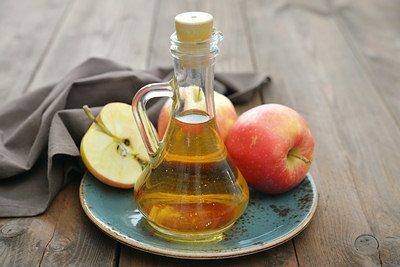 Even though apple cider vinegar has a sour and acidic taste, it works as a stimulator for the taste buds. It helps kill bacteria in the mouth to help restore your smell and taste senses. It also helps treat a sinus infection. 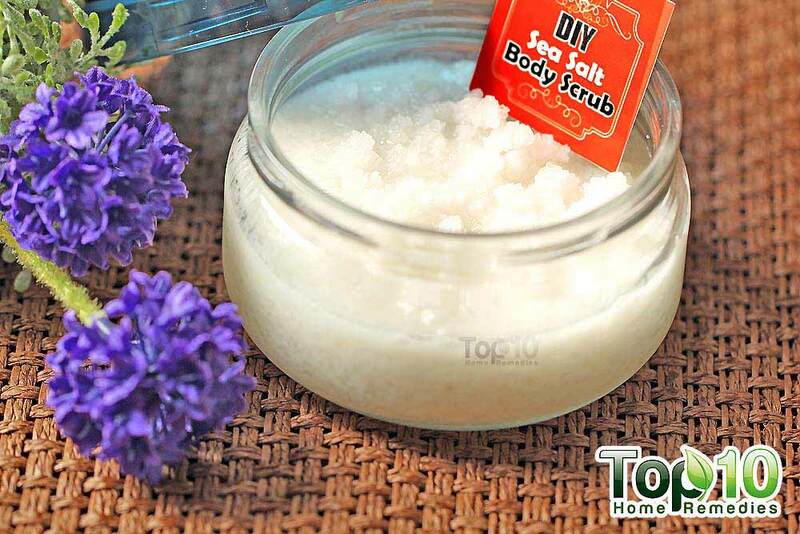 Add 1 tablespoon of raw, unfiltered apple cider vinegar and ¼ teaspoon of baking soda to ½ glass of water. Drink this solution 2 times a day. Alternatively, just add 1 to 2 teaspoons of raw, unfiltered apple cider vinegar and a little raw honey to a glass of water and drink it before meals 2 or 3 times a day. Oil pulling, an ancient Ayurvedic practice, can help restore your sense of smell. Oil pulling helps keep your taste buds moist, which is helpful in improving your sense of taste. Plus, it aids in the removal of toxins from your mouth as well as body. You can do oil pulling with coconut, sesame or any edible vegetable oil. 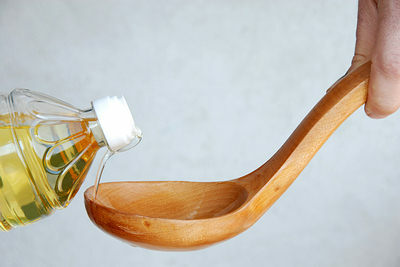 Swish the oil thoroughly around your mouth for 10 to 15 minutes. Finally, brush your teeth as usual. Follow this process daily in the morning before eating anything. Note: Do not swallow the oil. 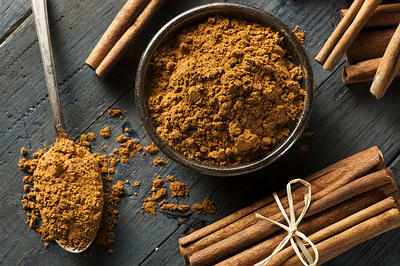 According of Ayurveda, cinnamon can help treat loss of smell and taste. Its strong flavor can stimulate taste buds, while its sweet smell can enhance your smelling power. Thoroughly mix equal amounts of cinnamon powder and raw honey. Rub this mixture on your tongue. Leave it on for 10 minutes, then rinse your mouth with lukewarm water. Repeat twice daily for several days. Zinc deficiency is often associated with loss of taste and smell. 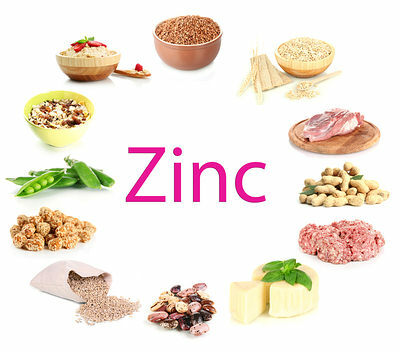 Hence, eating more zinc-rich foods or taking a zinc supplement may help clear up your problem. Symptoms of zinc deficiency include white spots or deep horizontal ridges on your nails, hair loss and slow healing. If you see these signs, ask your doctor to test for this deficiency. 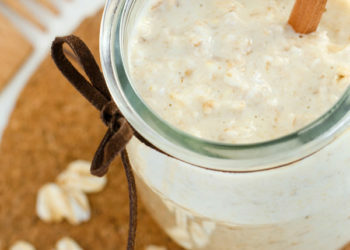 Eat more zinc-rich foods like oysters, beans, nuts, whole grains, fortified breakfast cereals and dairy products. You can also take a zinc supplement, after consulting a doctor. Put a handful of crushed curry leaves in a glass of water. Let it sit for 30 minutes, strain and drink the water twice daily. Add 1 tablespoon of fresh mint leaves to 1 cup of water. Cover and steep for 30 minutes, then strain it. Drink this infusion twice daily. If blocked nasal passages due to a cold are causing loss of smell, adequate rest and sleep is the best remedy. Maintain proper oral hygiene. Brush and floss twice daily, and rinse your mouth thoroughly with water after eating. Take all possible measures to treat a sinus infection. Add spices to your foods to make them tastier. Include a variety of foods in each meal. This will help you enjoy your food. Quit smoking as it can permanently damage your smell and taste senses. Avoid very hot foods and fluids as they can damage your taste buds. Drink a glass of water at regular intervals to prevent dry mouth that can adversely affect your sense of taste. Use a humidifier to increase moisture in the air. Go for a brisk, 10-minute walk or run before eating a meal. Sense of smell is higher after exercise. I am reading your cownseling of the 10topremedies.It is very interesting and mayby helpful. I say maybe, beacouse I didnete try none yet. But I will start on it soon then I will say something! I read it 3-4 times. Tanks. it is very difficult to sense while cooking or otherwise. Please explain me should these remedies be tried all at a time. OR try one for week and then shift to next. what is L-carnosine will it help? Can I try steroid ? I am realy worried. I am using castor oil for my sense of smell and taste. Have only been using it for a couple of days, has helped some. How long before I will be able to smell everything? I also take a zinc supplement everyday! Thanks. I lost the sense of taste as a result of case of pneumonia in early December. I have not lost all sense of smell which gives me hope that I may recover some taste. I will try the suggested remedies. I had the Flu at Xmas, I went to the Doctor and was prescribed antibiotics as I also had a middle ear infection from it. I have since lost all my smell and taste. I have had a full blood test which showed all is now clear and have been told it may never return . It is very depressing, especially when you have to eat and cannot enjoy the foods you take for granted. Hoping for other ideas out there. If someone lose any sense, It will be big issue for him or her. I will tray each way from these remedies to get smell as soon as possible. Finally, Please don’t forget to ask God to help you. I loss smell and taste since from 3 years sinusities polyp surgery done only improve in respiratory not in taste and smell please tell some one who improve in anosmia I will thankful for them. I’m 67 years old and over the last 12 months or so I’ve lost most of my sense of taste. None of the usual explanations seemed to apply to me so I assumed it was age related. Last week I ate a serving of kimchee for the first time. The next morning my sense of taste had completely returned. Coincidence? I don’t know, but I will continue to eat kimchee. Following! Anxious to hear results! Following, and trying a few of these! Anxious to here others results. 6 months with dimenished smell, also foul smell sometimes, distorted smell of familiar things. have been taking vitamin B12, zinc, Vit C. Ginger, garlic, beets, carrots, Rhubard. smell is distorted still, have not had as much foul smell in last week. I did a scratch sniff test and go to ENT on this Thursday to see what else the doctor has for me. Never knew not being able to smell could be so horriable !! I had thyroid cancer I can differentiate sweet from savory but I can’t smell anything and I can’t tell what the savory is I’m eating or what the sweet is I’m eating , I can taste garlic and onion only can’t smell perfume smoke nothing!! What is what is Kimchee, where do you get it. I live in Mississippi. I can’t taste hardly anything. FYI – Kimchee is fermented/rotten cabbage, by the way. It is good for you, but it smells and tastes horrible, and a very strong horrible at that (like rotten feces). It’s one of the hardest tastes to acquire, but people do and end up liking it! You ca get Kimchee from Asian Market. I had a head injury six years ago and lost all sense of smell and taste. I will try all of these remedies. as it says ginger,would ginger ale help as well? I’m just getting through a bout of Stevens Johnson Syndrome. Sweet and salty are gone. I’m dying. I put some vapor rub in my nose even though it’s not recommended, then I put a bandana or thin silk scarf headband over my face making sure to cover my nose and mouth, then I rub a little bit of vapor rub on the outside of the scarf that covers my mouth and nose. Woke up the next morning and could smell for two days, then went back to not being able to smell for years again. Fluke? Beats me. I still try it to no avail. Head injury was the cause. God bless. Caroline…did the Kimchee help or not?